There are certain things in life that are best left to the professionals (dyeing your hair blonde, performing open heart surgery-you get the idea.) But basic car maintenance isn't one of them. Each month, mental_floss and GEICO will team up to walk you through an essential auto-related task, helping you become that much more accomplished (and not to mention, more financially responsible) in the process. Our lesson for August? Changing the blades on your windshield wipers. The Task: Replacing your damaged or worn-out windshield wiper blades. When it comes to safe driving, visibility is key. In stormy conditions, a good pair of windshield wiper blades can save your life. Yet, as with all car parts, they do wear out after a while. How can you tell when it's time to get some new ones? Ideally, both wiper blades should be replaced every six months. Car-owners also need to listen closely whenever the wipers are in use. If the blades make any slapping, squeaking, or chattering noises, discard them as soon as possible. Here's a money-saving tip. 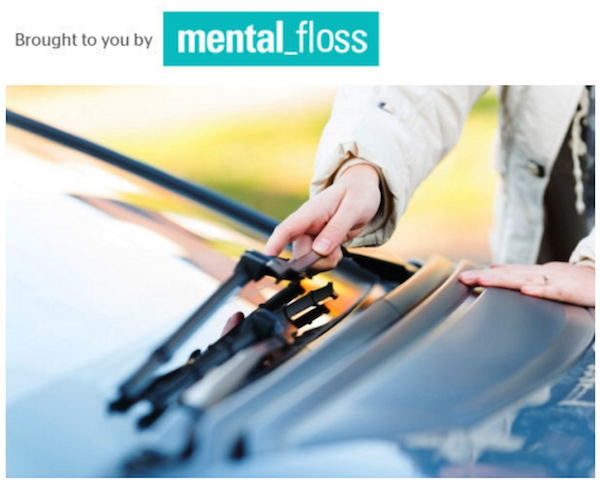 Let's say that your wiper blades are performing smoothly and you don't hear them making any weird sounds. But what should you do if the contraptions have been smearing dirt all over the windshield? Not to worry. In this scenario, you probably won't need to buy new units right away. Instead, simply dip a rag or paper towel into some rubbing alcohol and use it to clean off the blades (for best results, clean the windshield as well). Doing so will extend the life of your present blades for another month or two-after which time, you will have to bite the bullet and finally discard them. Okay, so you've determined that your blades have got to go. Visit the nearest auto parts store. Once you're there, you'll want to get the right blades for your car. You'll need to find blades that are the correct length and compatible with the attachment points on your car's wiper arms. Luckily, many parts stores have printed guides in the wiper blade section to point you to blades that fit for your car. Alternatively, if you have time to wait for shipping, most online parts suppliers will let you search by make and model information to find compatible blades. These new blades will usually cost anywhere from $12 to $20 apiece-and, naturally, twice as much for a pair. Most mechanics would urge you to replace both of them simultaneously. After all, when one blade wears out, it's safe to assume that the other is on its last legs, too. Climb into your car, turn it on, give your windshield a squirt of wiper fluid to lubricate its surface, and then start the wipers. When the two blades reach their apex, immediately turn the vehicle off. You'll want the upper tip of both blades to be pointing towards your car roof. Before you finish positioning your blades, familiarize yourself with the key components of your wipers. First, there's the blade. This is a sturdy frame containing the long, rubber strip that actually touches your windshield. Each frame is connected to an arm, which swings the blade to and fro over the glass. Grab onto the arms and gently pull them forward until they're standing upright at a 90-degree angle to the windshield. Once situated in this manner, the arms are designed to lock into place (listen for a "snap" to know when this happens). Orient each blade so that it's dangling horizontally. Afterward, it's time to break out that owner's manual again. Car makers have a few different ways of connecting wiper blades to the arms. However, in most vehicles, you'll find a tab at the spot where these two components attach. Generally, you can disconnect the blade by using a finger to push said tab either outwards or inwards. As you do this, grab the blade and pull it down parallel to the wiper arm. Eventually, you'll have taken it off completely. Remember, though, that not all cars use the same sort of tab apparatus. You may have what are known as pin-type connectors in which a small pin holds the blade in place. To remove this type of blade, simply use a small flathead screwdriver to lift the connecting pin and slide the blade off. If your vehicle has an atypical setup, the manual should come with custom blade removal steps. Taking off the old blades will expose a long, flat metal hook atop each wiper's arm. Your wipers' arms will probably stay in place on their own, but it's worth taking a moment to wrap a clean rag around the hooks. At this point, the worst thing that could possibly happen would be for the arms to suddenly snap back down onto the windshield, creating some nasty cracks. Once you have the arms wrapped, gently lay them down onto the glass. Your future self will thank you. Assuming you haven't done so already, remove each new blade from its packaging. Now return the arms to their erect, upright position. The next step will depend on what type of attachment mechanism your car uses for its blades. Wiper blades that use the common "hook-slot" type of connection are a breeze. At the bottom of each blade, you'll find a tab suspended in the middle of a long, rectangular hole. Slide the arm hook up and over the tab, then pull the blades upwards until you hear a "snap." This signifies that the new units are secure and ready for action. If your car has pin-type connections, those blades are easy to replace, too. The fresh blade will have a small hole in its body. Simply align the hole with the pin, and it will snap into place to lock the new blade. Since the wiper arms will already be up at this point, you might as well perform a little car hygiene. Using water, automotive glass cleaner, a clean rag, and a little elbow grease, take a few minutes to clean the windshield. Doing so will really help you get the most out of those clean windshield wiper blades. When you finish, put the arms back down and enjoy the satisfaction of a job well done. Get more expert car-care tips from the pros in the Auto Care section.